Gov. Mike DeWine (R) is calling for an 18-cent-per-gallon increase in Ohio’s fuel tax as part of his first transportation budget; an increase expected to raise an estimated $1.2 billion a year for state transportation needs, including $480 million for local government projects, according to news reports. The Governor’s office added that the fuel tax hike would take effect July 1 and will be tied to the consumer price index each year starting in July 2020 so it will increase with inflation. The push to raise Ohio’s fuel tax comes after the majority of a special 15-member committee formed in January by Gov. DeWine rallied around raising that tactic in an 89-page report issued on Feb. 15. “The only funding mechanism that generated broad consensus was an increase in the motor fuel user fee,” the Advisory Committee on Transportation Infrastructure noted in its report. “Because neighboring states have higher motor vehicle user fees, an increase in Ohio would meet the state’s transportation requirements without hurting its economic competitiveness,” the group added. Jack Marchbanks – tapped by Gov. 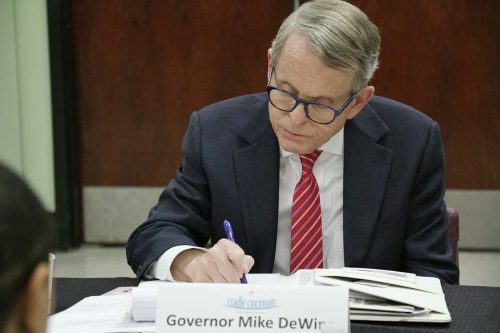 DeWine to be the Ohio Department of Transportation’s new director in mid-January – testified before the committee that his agency’s “revenue hole” will average of $1 billion over the next 11 years: $500 million for maintenance projects, $250 million for safety projects, and $250 million for new, major projects. He stressed, however, that “annual shortfall” only includes Ohio DOT projects; it doesn’t take into account “local needs,” which could be as high as $1.5 billion annually. “County, township, and municipal governments are facing the same fiscal challenges as Ohio DOT and rely on the same motor fuel user fee that hasn’t changed since 2005,” Marchbanks told the committee, adding that local governments haven’t benefited from the borrowing his agency and the Ohio Turnpike Commission have done over the past 15 years. Marchbanks said, however, with an additional $1 billion a year, it would take Ohio DOT just “five to seven years” to catch up on deferred maintenance projects. The committee added in its report that several other funding options were discussed but did not gain “consensus support” among its members. One involved leasing state land for oil and gas exploration, including drilling under transportation easements for which the Ohio DOT might not control mineral rights; a strategy one committee member said Pennsylvania used to generate $420 million in 2008 and $100 million annually since. Another involved county governments, municipalities, and townships levying a “permissive fee” on vehicle registrations, ostensibly as a way to fund local transportation projects. Finally, the committee called for reaching a balance between “encouraging innovation” and “collecting a fair share” of funding from electric and hybrid electric vehicles to cover road wear and tear.